Breakfast was good, simple and basic for every day. A great parking lot that is attached to many amenities. Great location, rooms were clean, atmosphere was good. Excellent location. Really close to IHOP! Also a Denny's next door. Loved the family suite and pool are and water slide/ hot tub is a nice feature for family as well as the breakfast room. It was an awesome experience, the front desk girl was great, even with the mix-up of rooms. Offered assistance to fix the issue, pool was great, attended a concert had no issues coming back so late even the night desk attendant helped with extra blankets without it being an issue Thankyou for a great stay!!! Staff were so nice and helpful. Pool was great, loved your pillows! I would like to thank Ms. Pretty at Front Desk. She is very helpful and friendly. I think the best part of my experience was her customer service. 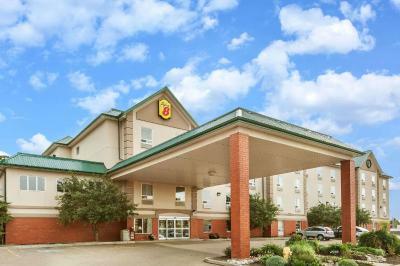 Super 8 by Wyndham Edmonton South This rating is a reflection of how the property compares to the industry standard when it comes to price, facilities and services available. It's based on a self-evaluation by the property. Use this rating to help choose your stay! Located just off the Queen Elizabeth II Highway, this Super 8 features an indoor saltwater pool with a 25-foot tall water slide. A daily breakfast is included with all rooms. Free Wi-Fi is available. Rooms at the Super 8 Edmonton South are decorated in bold colors and contain a mini-refrigerator. 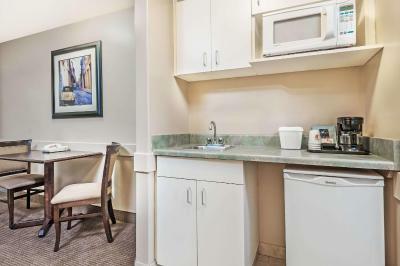 Cable TV and ironing facilities are included. A whirlpool is in the same room as the pool. The room has many windows and a mural of an underwater scene. A business center is available. This property is non-smoking for guests' comfort. The Edmonton South Super 8 is less than 14 miles from the Edmonton Municipal Airport. Mill Woods Golf Course is less than 10 minutes away. 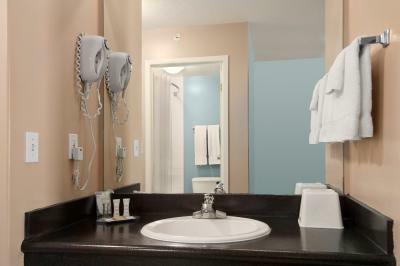 When would you like to stay at Super 8 by Wyndham Edmonton South? This suite has a microwave, flat-screen TV and seating area. This suite has air conditioning, spa bath and flat-screen TV. 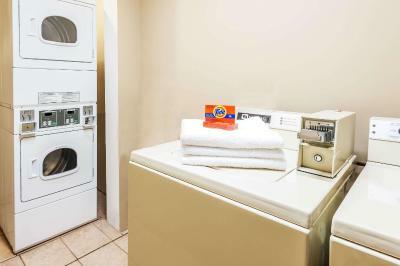 The Super 8 Edmonton South is a family owned and operated hotel since it's inception in 2000. The family treat this as their second home. Our amazing staff make you feel as if this is your second home too. House Rules Super 8 by Wyndham Edmonton South takes special requests – add in the next step! Super 8 by Wyndham Edmonton South accepts these cards and reserves the right to temporarily hold an amount prior to arrival. Please note that a security deposit will be charged upon arrival and refunded on check out pending any possible charges. Only credit cards can be used to pay for the security deposit. Had to clean the showerhead in order to take a shower because it was gross. Had apple juice at the continental breakfast and there ended up being what looked tiny bugs in the cup. Not sure if it was from the apple juice container or the cup but it wasn't pleasant to find. The lady in charge however, was kind and replaced it for me. Had to wait a few minutes for service to check out as there was no one at the counter and there was no bell to call for someone; had to look around for someone to call the front desk person. The tall ceilings in the room. It was a very spacious room. The bed was comfy enough but not the best. Flat pillows and not enough. Pool, hot tub, clean room, great breakfast and friendly staff. Breakfast bar was very good. There are not enough blankets on the bed. Staff are friendly. Pool is great. Nice to be able to have breakfast at the hotel some more healthier options for breakfast would be great. More sugar and cream and coffee in the room please! The breakfast was perfect, the pool was perfect. The rooms were laid out strange, toilet and bath were behind a door, I wouldn't call it a bathroom., more like a toilet and tub stall....the sink qas in the room itself. The staff were rude and insulting. Eggo waffles were served for breakfast, on paper plates. My 11yr old daughter wouldn't even eat. The pool was cold and the waterslide was dark. This was the big reason for choosing this hotel for my little girl to swim, she wasn't happy. How cold the pool was, with icicles building at the exit doors on the pool. Thinking fire exit hazard. Very unsanitary hot tub. Not a very large hot tub, was going to get in, when there was a very noticeable grime ring around the water level edge of the hot tub. It was like climbing into someone else’s bath water after they haven’t bathed for a month. How dirty the spa bath tub was (every time we turned on the jets, brown debris came out, we filled the tub 3 times and turned on the jets, and every time more debris came out). The noise level was quite high in the hallways, and every time some came in or went out of the hotel in the lobby, we could hear the sliding doors in our room. The continental breakfast was not really that good either. The room size was good, the layout of the room was good.